Inductive loading: placing a loading coil (inductance) somewhere between the feedpoint of the antenna and the tip of the radiator. This compensates for the capacitive feedpoint reactance of the short radiator. End-hat loading with a "capacitive hat", typically installed at the tip of the radiating element(s). This counteracts the tapering off of the current distribution between the feedpoint and the tip of the radiator. It also raises the radiation resistance of the antenna, i.e., makes the antenna a more effective radiator. Linear loading, by folding a long radiator wire in a zig-zag form onto itself. The result is a radiating element that is three or four times shorter than the overall wire length. The folded wires are parallel and closely spaced. The interaction between the parallel wires is complex, and introduces sub-band resonances (ref. 3C). Helical loading, by winding the radiator into the form of a linear spiral. I.e., a distributed inductor. Obviously these loading methods can be combined. Linear-loading and end-hat loading, by themselves, will not sufficiently reduce the resonant frequency of a radiator that is really short. It will have to be combined with inductive loading. Let's take a vertical monopole radiator that is short with respect to the desire operating frequency. To make it resonant at that frequency, some form of loading is required. By the way: resonant operation is not a requirement - it just makes coupling to a feedline easier. One standard solution is "inductive loading": placing a loading coil somewhere between the feedpoint at the bottom of the monopole and the tip of that monopole. The current-distribution along the radiator is such that the current is highest at the feedpoint. Placing a loading coil here, requires the smallest inductance. The current-distribution tapers off, from maximum at the feedpoint to zero at the tip of the radiator element. So, as the loading coil is placed farther away from the feedpoint, a larger inductance is required. At the tip of the radiator, the current is zero. This would require an infinitely large inductance. See the diagram below. The placement of the coils does affect the shape of the current distribution, but does not change the fact that it is maximum at the feedpoint and zero at the tip. Base-loading (i.e., at the base/bottom of the vertical radiator) is often easier to construct than off-base loading. Also, coil placed at the based of the antenna may be more easily accessible. So why not always use base-loading? This is primarily driven by coil losses, hence, efficiency of the antenna. The coil losses basically depend on the current, coil dimensions, material, construction, and core. Depending on the diameter of the radiator element (tubing, wire) and installation height, the most efficient placement of the loading coil is somewhere between 30 and 60% away from the feedpoint (ref. 1, 10). I.e., around the mid-point. Note that the efficiency-vs-placement curves are fairly flat over a relatively large range around the mid-point. Note that this tends to shift towards the tip of the monopole when "capacitive hat" loading is added. Ref. 4. My 80 m short vertical antennas with base-loading are described on this page. With material left over from my base-loaded designs, I have decided to make a center-loaded vertical for 80 mtrs. I have a section of 1.5 m (5 ft) copper tubing (16 mm OD, 5/8"), and 2.5 m aluminum tubing (7½ mm OD). OK, so the coil will not be exactly at the half-way point of the 4 mtr "short" antenna. And: yes, I know, I will be "mixing metals", which is not optimal from a corrosion point of view. I will use my standard PVC "mast". 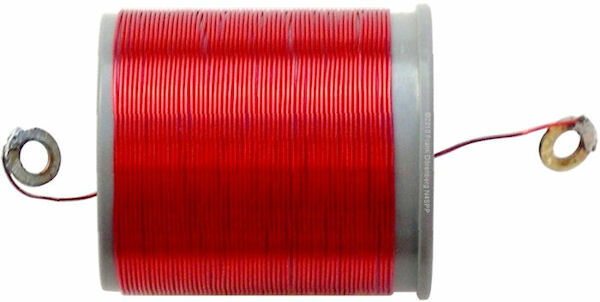 I have been making my loading coils with AWG #20 (0.812 mm Ø) enameled copper wire on a PVC core. 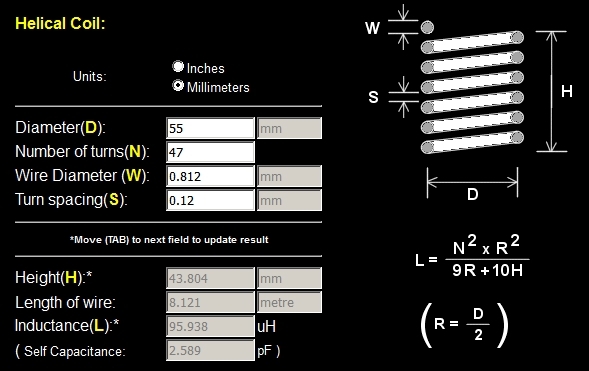 Based on an on-line calculator for helical coils (ref. 7A), the required inductance should take 47 turns of that wire on a 55 mm (2.2") core. Note that I entered anon-zero turn spacing value. I have measured quite a number of "close-wound" loading coils that I made. With my personal coil winding technique, I obtain a close-wound turn spacing of about 0.12 mm (≈ 4 mils). Note that "Harry's Law of Coils" always applies! As Harry (SMØVPO) says: 1) You cannot wind coils like I, and I cannot wind coils like you. 2) Coil-winding data is a constant that varies from person to person. Of course, I will start with more than 53 turns: 59. It is easier to remove turns than to add! As usual, I will use PVC parts from the do-it-yourself store. 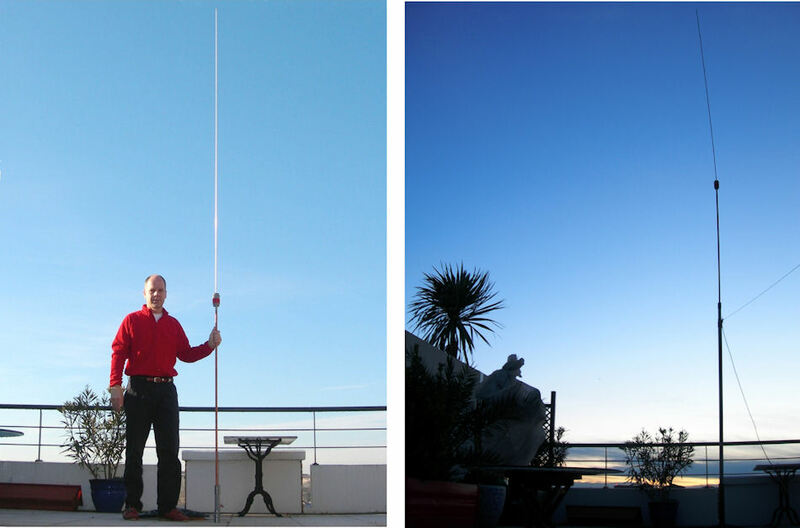 My standard mast for this size antenna is a 2 mtr (6 ft) section of PVC tubing with an outer diameter (OD) of 40 mm (1.5"). So I need to make a holder for the antenna. The 16 mm OD copper radiator fits easily into a short section of 32 mm PVC tubing - smaller PVC diameters are too flexible. So, the base of the PVC holder begins with a 40-to-32 mm PVC adapter piece. To prevent the antenna falling out of the bottom of the base, I glued in a PVC disk. I made the disk by simply slicing off the top of a 32 mm PVC end-cap. The disk has drain holes and a center hole, for the bottom bolt of the Cu tubing. The top of the PVC holder consists of a 32 mm female-to-female sleeve/coupler, and a 32 mm end-cap. A made a 16 mm hole in the end-cap, so the copper tubing can pass through it. The PVC end-cap has to be slid onto the copepr tubing before soldering the brass end-caps onto the latter. The radiator comprises a 1.5 mtr section of copper tubing, and a 2.5 mtr section of aluminum tubing. Both ends of the Cu tubing will have a brass end-cap soldered onto them. The end-caps have a 6 mm hole drilled into their center. A 6 mm bolt is mounted into each end-cap, with flat washers and lock washers. Unlike the round-head bolt shown in the photo below, I actually used ended up using bolts with a hexagonal head - so I can use a socket wrench. Once the brass end-caps are soldered onto the copper tubing, you can no longer get to the screw heads, so they have to be really tightened! The coil is wound onto a female-to-female PVC sleeve/coupler for 50 mm OD tubing. The sleeve has an OD of 55 mm. End-caps are installed into this sleeve. I drilled a 6 mm (14") hole in the center of the ednd-caps. The bottom cap will receive the bolt that is installed at the top of the copper tubing. The end-caps have a screw-on cap. The bottom screw-on cap is PVC-glued onto its threaded ring. The ring is then PVC-glued into the 50 mm sleeve. The top cap will get a 6 mm bolt that sticks out the top. The aluminum top-radiator will be screwed onto it. A deep M6 thread has to be tapped into both ends of the aluminum tubing. Large washers are used on the inside and outside of the end-caps. This is reinforces the end-caps, against bending moments when the antenna sways. Three rows of small holes are drilled into the 55 mm PVC sleeve. The wire end at the start of the coil (on the right in the drawing below - this is the bottom end of the coil) is woven through the single set of three holes. The wire is pulled tight through these holes; this helps secure the windings. The coil is tightly wound by hand. The wire at the opposite end of the coil is woven through the nearest set of three holes. The first turn of the coil (on the right in the drawing) is glued in place. I use waterproof 2-component epoxy glue for this. The last winding (on the left) will not be glued in place until the coil is tuned - by removing turns. A brass 6 mm flat washer is soldered to each wire end. At this point, the bottom end-cap is glued into the bottom end of the coil core. The bolt at the top of the copper tubing is passed through this end-cap. The brass washer at the bottom wire end of the coil is slid over the bolt, then a lock washer, and then an M6 nut. The nut is tightened solidly with a socket wrench. Note that there is a large flat washer on both the inside and outside of the PVC end-cap. The top end-cap is done similarly. An M6 bolt is passed through a lock washer and the brass washer at the top end of the coil, then through the end-cap - inside to outside. There is a large flat washer at the inside and outside of the PVC end-cap. A lock nut is fully tightened onto the outside of the end cap. The end-cap is inserted into the PVC coil core. Do not turn the end-cap - or you will break the coil wire!! As the end-cap will be removed several times during the coil tuning process, this end-cap is not yet glued in! It is held in place with 3 or 4 small self-tapping screws (small pre-drilled holes) through the sleeve, into the insert of the end-cap. The antenna is installed on top of a 2 mtrs section of 40 mm PVC tubing, stuck into a heavy umbrella stand. I use my standard single-radial of 7 mtrs, installed horizontally at 2 mtrs above ground level. I.e., an L-antenna configuration (ref. 5). I started out with 59 coil turns, compared to the 47 suggested by the coil calculator. I reduced the number of turns step-wise, see the table below. I measured resonance frequency and SWR, both with and without a 4:1 balun at the feedpoint. The resonance frequency is now just above my upper target frequency of 3580 kHz. With an integer number of turns, it is impossible to get right on target. Also, the resonance frequency will vary with temperature, etc. The final tuning step reduced the number of turns by five. This increased the resonance frequency by 270 kHz, about 54 kHz per turn! A slightly high resonance frequency is equivalent to a slightly short radiator. This is easy to fix! Both ends of the aluminum radiator section have an M6 thread in them (I have done this before, hi). The top end is open. An M6x80 screw will a large round head will serve as tuning rod. This works very well! The plot below shows an SWR=2 bandwidth of about 100 kHz. The residual SWR is 1.3 - no problem. Ref. 2: "Vertical antennas", by Ulli Weiss (DJ2YA), Chapter 9 in "Low-Band-DXing" by John Devoldere (ON4UN), edt. Ref. 6C: Loaded dipole calculator (.exe)" by Al Legary (VE3SQB). Note: the GUI of this calculator shows inductance as "mH" instead of "μH"! Ref. 7B: "K1QW Inductor Calculators"
Ref. 7C: "ON4AA Single-layer Helical Round Wire Coil Inductor Calculator"
Ref. 9: "Turns-length calculator for ferrite and iron powder core toroids"
Ref. 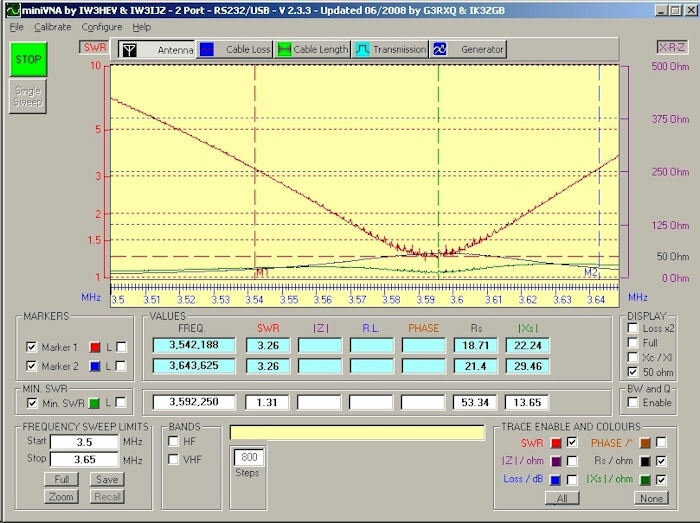 11A: "An experimental look at ground systems for HF verticals", Rudy Severns (N6LF), in "QST", March 2010, pp. 30-33.